18540 E. 9 Mile Rd. Keeping Good Oral Hygiene Habits? Which Implant Crown Attachment is Right for You? Dr. Jost has been my family's dentist for the past 25 years. His professionalism and care have been outstanding! I have sent many friends and family to him and no one has been disappointed. He is gentle, kind, considerate and delivers excellent dental care. Most people say they HAVE to go to the dentist. My husband and I both LIKE to go! After 30 some years, we consider Dr. Jost and his staff part of our family. Whenever we have an "emergency" Dr. Jost makes time for us. To anyone looking for a dentist - give Dr. Jost a try. You won't be disappointed and your smile will thank you. Go Red Wings! By Peter Jost, D.D.S., P.C. Your front teeth are the stars of your smile — so it makes perfect sense to replace them if they’re missing. But is it really necessary to replace a largely unseen back tooth with an implant or bridgework? The answer is an unequivocal yes. Your individual teeth are an interactive part of a dynamic mechanism that enables you to eat, speak and smile. They’re highly adaptable and can move incrementally to accommodate mouth changes — especially when one of them is lost. Back teeth not only help us chew food efficiently, they also ease some of the pressure from front teeth as we chew. Our efficiency while chewing suffers when they’re missing; other teeth will wear faster and tend to move out of position, “drifting” into the space left by the missing tooth. And without their stimulation during chewing, new bone may grow at a slower rate to replace older bone, reducing bone volume over time. So, whether visible or not, replacing a back tooth is the best course to take to prevent these adverse consequences. Your two best options are fixed bridgework or dental implants, each with their own advantages and disadvantages. Bridgework has been the traditional method for replacing one or a few missing teeth: they’re long-lasting if cared for properly, have a life-like appearance that blends well with other teeth and are a good option when implants aren’t. But they require extensive altering of the anchor teeth (those used on either side of the bridge to secure it) and they’re highly prone for trapping food between them and the gums, increasing the risk of disease. Dental implants are easily maintained and their installation doesn’t affect adjacent teeth as with a bridge. They’re also durable with a 95% success rate after ten years. On the other hand, the installation process can take several months and visits, and they require a certain amount of bone mass for proper placement and so aren’t ideal for certain patients. Regardless of its location, if you have a missing tooth or one that may need to be removed, you should visit us for a complete examination. From there we can tell you how your mouth has been impacted by the missing tooth and which replacement option is best for you. Patients who have missing teeth or major tooth and gum problems often have questions about dental implants. Implants are the modern solution for replacing teeth and are now often preferred over other solutions like dentures and bridges. Here are a few of the most common frequently asked questions about dental implants, answered. Having more knowledge of this dental treatment may inspire you to take action and call your Eastpointe & St. Clair Shores, MI dentist to see if you’re a candidate for this procedure. Dental implants are designed to serve the same purpose as the root of a tooth. They are small titanium devices that resemble screws that are inserted into the bone tissue below the gumline. When the implant heals into the bone, which may take several months, an abutment and permanent crown are placed on the top. With a porcelain or ceramic crown, the implanted tooth is indistinguishable from your other teeth. Why Are Dental Implants the Best Solution? The main reason why dental implants are the ideal solution is that they are permanent. Once they’re installed, they’re no different than any of your other teeth in terms of function and appearance. They also help keep the bone tissue healthy and strong. 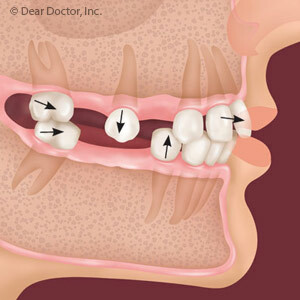 When you get dentures or bridges, the bone tissue can degrade over time. Only patients who have generally good dental health can get dental implants. Viable bone tissue is needed to ensure that the implants will stay rooted. That’s why it’s important to see a dentist for a tooth implant as early as possible. In some cases, a bone grafting procedure can help improve a patient’s chances of having a dental implant integrate successfully. How Long Will Dental Implants Last? For patients of a certain age, a dental implant has a good chance of lasting for a lifetime. The crown part of the implant can last for up to 15 years before it may need to be replaced. Seeing your dentist at least two times every year for professional cleanings and becoming meticulous about at-home dental care will ensure that the implant (and your other teeth) stays strong and healthy. Dental implantation is a straightforward and effective procedure that can help improve your dental health and the appearance of your smile. Call your Eastpointe & St. Clair Shores, MI dentist to schedule an appointment.